"Never the Muse is absent from their ways: lyres clash and flutes cry and everywhere maiden choruses whirling. Neither disease nor bitter old age is mixed in their sacred blood; far from labor and battle they live." They lived for 1000 years. Alone among the Twelve Olympians, Apollo was venerated among the Hyperboreans, the Hellenes thought: he spent his winter amongst them. Yperborea.."Never the Muse is absent from their ways: lyres clash and flutes cry and everywhere maiden choruses whirling. Neither disease nor bitter old age is mixed in their sacred blood; far from labor and battle they live." They lived for 1000 years. Alone among the Twelve Olympians, Apollo was venerated among the Hyperboreans, the Hellenes thought: he spent his winter amongst them. Just as Plato had cited the Egyptian legend of the sunken island of Atlantis, the Greek historian Herodotus mentioned the Egyptian legend of the continent of Hyperborea in the far north. In Greek mythology the Hyperborean people lived "beyond the North Wind". The Greeks thought that Boreas, the god of the North Wind (one of the Anemoi, or "Winds") lived in Thrace, and therefore Hyperborea indicates a region that lay far to the north of Thrace. This land was described as perfect, with the sun shining 24 hours a day, suggesting a location within the Arctic Circle. According to the classical Greek poet Pindar. "Never the Muse is absent from their ways: lyres clash and flutes cry and everywhere maiden choruses whirling. Neither disease nor bitter old age is mixed in their sacred blood; far from labor and battle they live." They lived for 1000 years. Legends. Alone among the Twelve Olympians, Apollo was venerated among the Hyperboreans, the Hellenes thought: he spent his winter amongst them. For their part the Hyperboreans sent mysterious gifts, packed in straw, which came first to Dodona and then were passed from tribe to tribe until they came to Apollo's temple on Delos (Pausanias). Abaris, Hyperborean priest of Apollo, was a legendary wandering healer and seer. Theseus visited the Hyperboreans, and Pindar transferred Perseus's encounter with Medusa there from its traditional site in Libya, to the dissatisfaction of his Alexandrian editors. Physical appearanceGreek legend asserts that the Boreades, who were the descendants of Boreas and the snow-nymph Chione (or Khione), founded the first theocratic monarchy on Hyperborea. This legend is found preserved in the writings of Aelian: "This god [Apollon] has as priests the sons of Boreas (North Wind) and Chione (Snow), three in number, brothers by birth, and six cubits in height [about 3 metres]." The Boreades were thus believed to be giant kings, around 3 metres tall, who ruled Hyperborea. No other physical descriptions of the Hyperboreans are provided in classical sources. However, Aelius Herodianus, a grammarian in the 3rd century, wrote that the mythical Arimaspi were identical to the Hyperboreans in physical appearance (De Prosodia Catholica, 1. 114) and Stephanus of Byzantium in the 6th century wrote the same (Ethnica, 118. 16). The ancient poet Callimachus described the Arimaspi as having fair hair but it is disputed whether the Arimaspi were Hyperboreans. 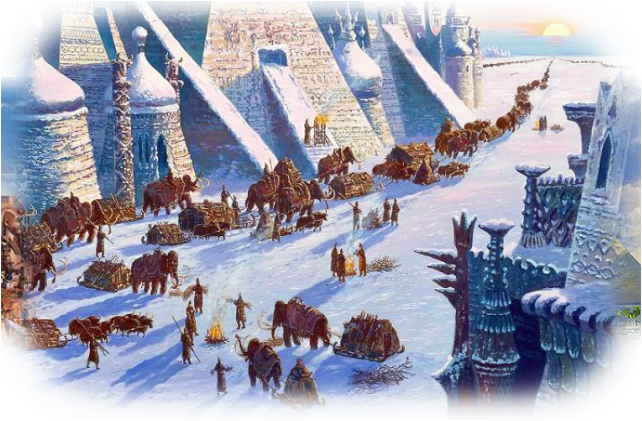 Hyperborea in modern esoteric thought H. P. Blavatsky, René Guénon and Julius Evola all shared the belief in the Hyperborean, polar origins of Mankind and a subsequent solidification and devolution. According to these esotericists, Hyperborea was the Golden Age polar center of civilization and spirituality; mankind does not rise from the ape, but progressively devolves into the apelike condition as it strays physically and spiritually from its mystical otherworldly homeland in the Far North, succumbing to the demonic energies of the South Pole, the greatest point of materialization (see Joscelyn Godwin, Arktos: The Polar Myth). Robert Charroux first related the Hyperboreans to an ancient astronaut race of "reputedly very large, very white people" who had chosen "the least warm area on the earth because it corresponded more closely to their own climate on the planet from which they originated". Miguel Serrano was influenced by Charroux's writings on the Hyperboreans. HerodotusThe earliest extant source that mentions Hyperborea in detail, Herodotus's Histories (Book IV, Chapters 32–36), dates from circa 450 BC. However, Herodotus recorded three earlier sources that supposedly mentioned the Hyperboreans, including Hesiod and Homer, the latter purportedly having written of Hyperborea in his lost work Epigoni: "if that be really a work of his". Herodotus also wrote that the 7th-century BC poet Aristeas wrote of the Hyperboreans in a poem (now lost) called Arimaspea about a journey to the Issedones, who are estimated to have lived in the Kazakh Steppe. Beyond these lived the one-eyed Arimaspians, further on the gold-guarding griffins, and beyond these the Hyperboreans. Herodotus assumed that Hyperborea lay somewhere in Northeast Asia. Pindar, Simonides of Ceos and Hellanicus of Lesbos, contemporaries of Herodotus in the 5th century BC, each briefly described or referenced the Hyperboreans in their works. Location of HyperboreaThe Hyperboreans were believed to live beyond the snowy Riphean Mountains which Homer first referenced in his Iliad (15. 171; 19. 358) or beyond the home of Boreas.